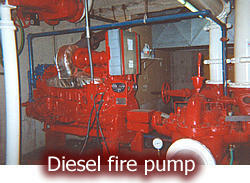 Fire safety pump inspection, testing, certification, and maintenance are comprehensive procedures. These fire services confirm that all fire pump system components are in good condition and will ensure the system’s successful operation. Lubrication System—change and clean crankcase breather as preventative maintenance. Exhaust System—to check for proper insulation and potential fire hazards. Battery System—to ensure the terminals are clean and tight. Electrical System—to correct any wire chafing where subject to moving. 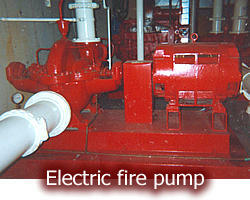 Supervisory—to ensure valve is in good condition, has proper movement from the valve’s normal position. The operating systems of outside screw and yoke valves shall be properly lubricated. Pump Operation—test to be conducted under minimum, rated, and peak flows by controlling the quantity of water discharged through approved test devices to ensure optimal capacity capability. Circulation Relief Valve—to ensure proper closure in accordance with manufacturer specifications. 500 GMP flow from highs outlet. 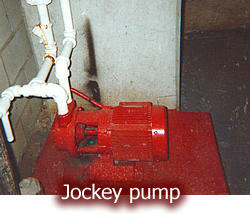 65% Capacity/100% Capacity/165% Capacity flow on pump. 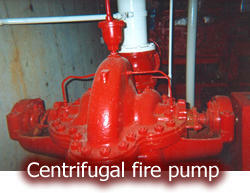 Contact A-Total Fire Protection to schedule your fire pump testing!